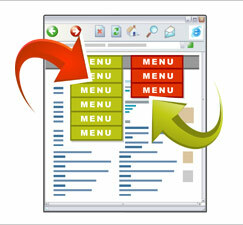 Managing and maintaining sophisticated menus is a breeze with Business Menu Manager. This module enables your entire website menu to be created and managed in-house with less than 10 minutes of training! Edit, Hide, Move, Delete or Add menus when and as your company's website grows. Business Menu Manager allows you complete and immediate control of your company's website menu and navigation, freeing you from the usual costs and time delays involved in using web-developers and graphic designers. Business Menu Manager offers you total flexibility whilst maintaining powerful sophisticated navigational outcomes for your company's website, intranet or extranet. 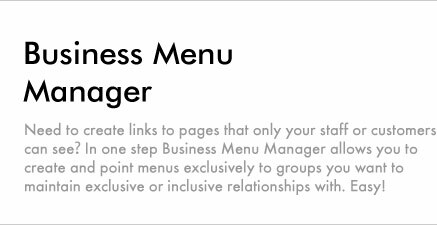 Business Menu Manager is included with the Business Website Creator (cms & crms). This adds immediate value and a saving of $4,400. For more information on Business Website Creator (cms & crms) click here. Dynamic Menuing gives your customers and clients an overview of your website's contents without having to perform a single click. That's efficient design through 'Dynamic Menus'. "In less than 10 minutes I was able to manage the entire menu and navigation system of our website. It was that simple. I could determine which menus could be seen by which users, and edit any menu in real time, with just a few clicks."